If you want to learn to row, the best way to get your feet wet is to join us for one of our Learn to Row Days in the spring, summer or fall. To attend, purchase a seat in one of our 6 time slots from our online store. Spots for the Learn to Row Day are on a first-come, first-serve basis with priority given to those that reserve a time in advance, so reserve your spot as soon as possible. After your introductory class, you’ll have the opportunity to sign up for the Novice Boot Camp weekend in the spring, which is the first step in joining the Des Moines Rowing Club. For your introductory class on Learn to Row Day, you’ll spend approximately two (2) hours with us. You’ll first learn the basics of the stroke on the erg (rowing machine), rowing terms, parts of the boat, and how to lift and maneuver the boat. Next, you’ll go out in an eight-person boat with an experienced coxswain, stroke and bow rower. You’ll apply the same basics of the stroke you learned on the erg and become familiar with a few basic commands from the coxswain. There is no commitment to join the club by participating in Learn to Row Day, but it’s a great way to find out if you’d like to go through our Novice Boot Camp Weekend Program! One of the most important things to bring to Learn to Row Day is your calendar, because if you decide to participate in our Novice Boot Camp Weekend Program, you’ll be able to sign up for a spot in a crew in one of the six (6) weekends that boot camp will be held. Don’t forget your socks! Our boats are rigged with shoes that you will use while rowing so you will want a pair of socks. What if I want to join DMRC? If you decide to participate in our Novice Boot Camp Weekend Program, you’ll be able to sign up for a spot in one of the six (6) weekends that boot camp will be held. This is a first-come, first-serve opportunity, so signing up on Learn to Row Day is the best way to secure your preferred weekend. To confirm your spot, you’ll need purchase your weekend ticket from our online store. 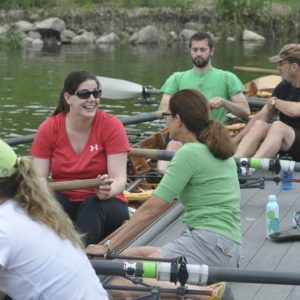 Graduates of the Novice Boot Camp Weekend will have the option to continue on by joining the Des Moines Rowing Club Post Novice Graduate Program held at the Des Moines Rowing Club’s main boathouse at Birdland Marina. This program will include additional training with a coach, and rowing 2x week to train for races beginning July 15, if desired. If you have any questions about Learn to Row Day or the Novice Program, please contact our Novice Coordinator.